Chilly weather through Friday, then warming up! DENVER — A chilly morning is in store for Colorado, lows will drop to the teens for Denver and the eastern plains and be in the single digits in the mountains. Skies will be partly cloudy across the plains, while some light snow lingers over the central and southwest mountains. Today will be dry in Denver and across the eastern plains, while a few inches of snow will fall in the southern mountain areas. Expect highs in the 20s in the mountains and upper 30s to middle 40s on the plains. Temperatures will reach the low to mid 40s on Saturday in Denver and be in the upper 20s to low 30s in the mountains under a mostly sunny sky. 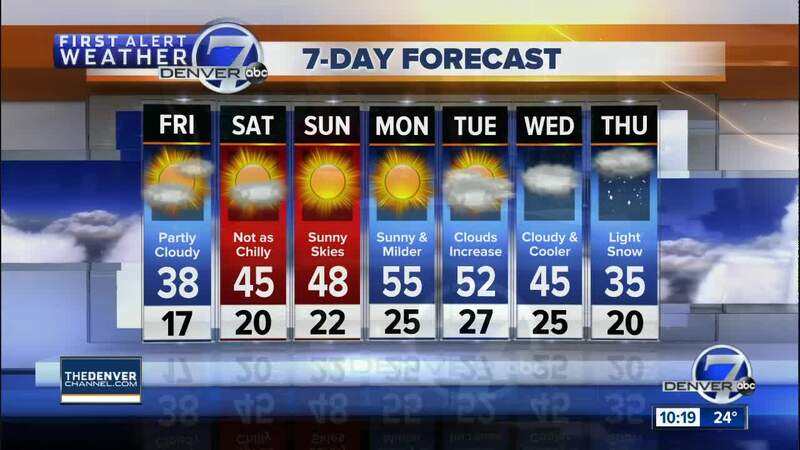 The long-range trend looks mild and dry for Sunday and early next week with highs returning to the low to mid 50s in Denver by Monday and Tuesday. Another storm system will spread some snow into the mountains by next Wednesday and bring an increase in clouds and cooler temperatures to the plains. Snow and colder weather is expected next Thursday.